This article is dedicated to my mother who has been my constant supporter. As a child, I loved opening her large glass cabinet full of colorful music boxes and turning the key on each one. Although the specific inventor is unknown, the earliest music boxes are traced back to the late 1700’s in Switzerland. The portable idiophones are comprised of only a few pieces; a rotating cylinder, a flat comb of prongs, and a handle or turn-key. To play the music box, one must turn the handle or key. This causes the cylinder within the instrument to rotate and brush against the pitched prongs. The melodic line is determined by the sequence of the raised spots on the cylinder; like fingers playing individual keys on a piano. Historians agree that music boxes were likely created in an attempt to miniaturize carillon towers; a system of large bronze bells that could be played by a keyboard in another room. According to the Encyclopaedia Britannica, a standard music box in the 1800’s was approximately thirteen inches long with ninety-six teeth and an interchangeable brass cylinder. The box itself was wooden, generally undecorated, and could be opened to observe the cylinder as it turned. Early music box makers included Reymond Nicole, Nicole Freres, and David Lecoultre. Original music boxes (now nearly two hundred years old) from the 19th century have been sold for between a few hundred and several thousand dollars from international auction houses like Bonhams (https://www.bonhams.com/about_us/) or Live Auctioneers (https://new.liveauctioneers.com/about). In the 1890’s, the cylinders inside music boxes were replaced with discs that were easier to store and replace; music box owners could now enjoy a larger variety of songs. This innovation, according to Thaddeus Kochanny of the Automatic Musical Instrument Collector’s Association (AMICA), was a step towards the creation of phonographs and player pianos. 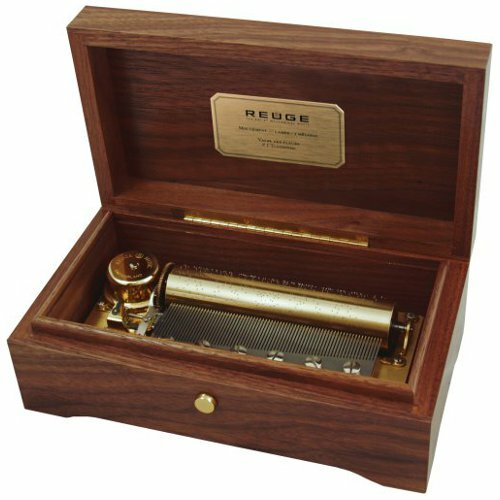 The rise of these more advanced instruments in the early 1900’s, as well as the impact of the Great Depression (1929-1939) on the U.S. economy, led to a dramatic decrease in music box sales. In the 21st century, music boxes are mostly produced for novelty purposes. The instruments come in nearly every form; jewelry boxes, clocks, snow globes, commemorative figurines, and more. Some music boxes are ornate, with intricate glasswork or paintings displayed on the lid. Other times, the containers are transparent glass or plastic so that the operator can view the inner workings of the machine as the music is produced. There are even music boxes with moving parts that spin or wave once the key is turned. Prices vary from a few dollars to several hundred depending on the materials used and the amount of decoration included. Currently "the world's largest music box" is the Müpa Budapest Sound Machine. It was unveiled in November 2015 as part of a music appreciation festival. The machine is powered by an enormous person-sized wheel that visitors may walk on like a treadmill. The enormous instrument is capable of playing a handful of songs; “The Ride of the Valkyries” (Wagner), “Hungarian Rhapsody No.2” (Liszt), and multiple movie themes including “Hedwig’s Theme” from Harry Potter. “Music Box.” The Editors of the Encyclopaedia Britannica. Encyclopaedia Britannica. Encyclopaedia Britannica Incorporated. N.d. Web. 3 June 2017. “History of the Music Box.” Collector’s World. Collector’s World Incorporated. N.p. N.d. Web. Instrument Collector’s Association (AMICA). N.d. Web 3 June 2017. Bonhams. N.p. 19 April 2011. Web. 3 June 2017. “Lot 2: A Nicole Freres Two-Per-Turn Cylinder Musical Box, Swiss, circa 1870.” Bonhams. “Mupa Melody Wheel.” Mupa Budapest. N.p. N.d. Web. 3 June 2017. “Mupa Melody Wheel.” We Love Budapest. N.p. N.d. Web. 3 June 2017.